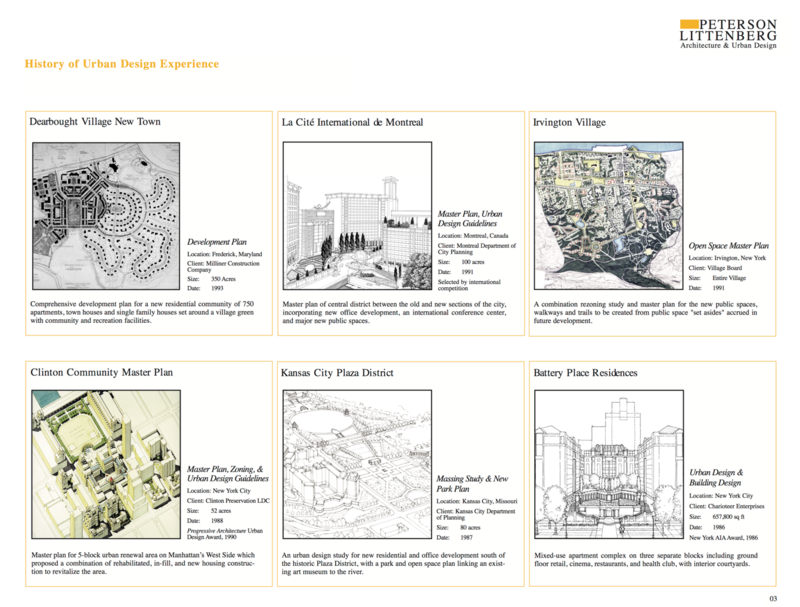 Multiple urban design plans and models were developed with the LMDC to demonstrate a range of physical site planning alternatives to rebuild the World Trade Center site in harmony with different memorial concepts, as well as cultural, civic and commercial uses. 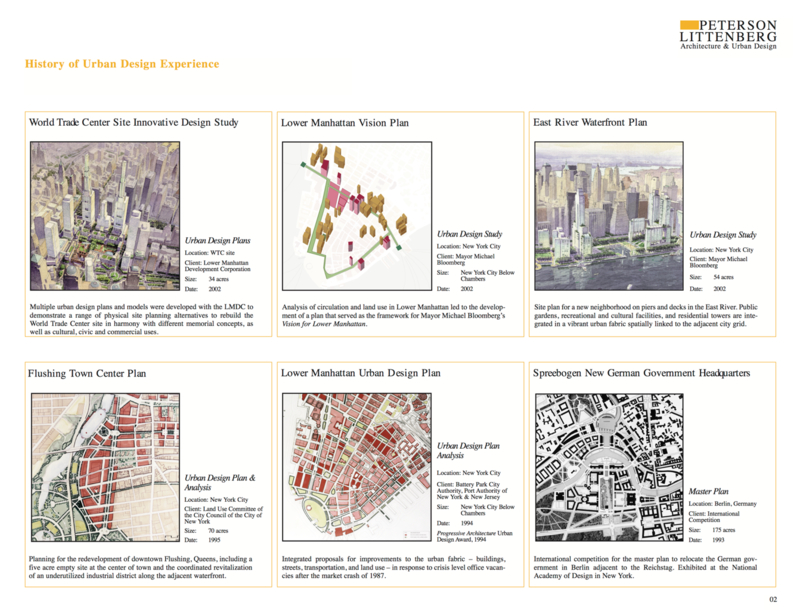 Analysis of circulation and land use in Lower Manhattan led to the development of a plan that served as the framework for Mayor Michael Bloomberg’s Vision for Lower Manhattan. Site plan for a new neighborhood on piers and decks in the East River. Public gardens, recreational and cultural facilities, and residential towers are integrated in a vibrant urban fabric spatially linked to the adjacent city grid. Planning for the redevelopment of downtown Flushing, Queens, including a five acre empty site at the center of town and the coordinated revitalization of an underutilized industrial district along the adjacent waterfront. 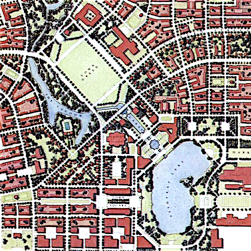 Integrated proposals for improvements to the urban fabric – buildings, streets, transportation, and land use – in response to crisis level office vacancies after the market crash of 1987.
International competition for the master plan to relocate the German government in Berlin adjacent to the Reichstag. 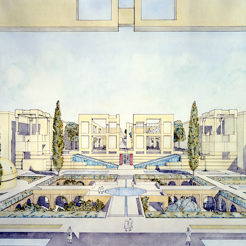 Exhibited at the National Academy of Design in New York. Comprehensive development plan for a new residential community of 750 apartments, town houses and single family houses set around a village green with community and recreation facilities. 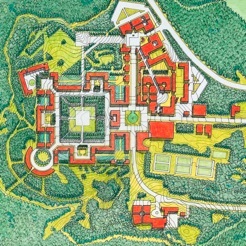 Master plan of central district between the old and new sections of the city, incorporating new office development, an international conference center, and major new public spaces. A combination rezoning study and master plan for the new public spaces, walkways and trails to be created from public space "set asides" accrued in future development. Master plan for 5-block urban renewal area on Manhattan’s West Side which proposed a combination of rehabilitated, in-fill, and new housing construction to revitalize the area. 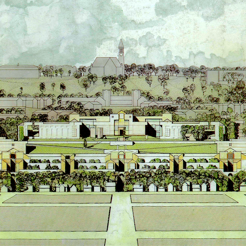 An urban design study for new residential and office development south of the historic Plaza District, with a park and open space plan linking an existing art museum to the river. Mixed-use apartment complex on three separate blocks including ground floor retail, cinema, restaurants, and health club, with interior courtyards. Urban design study to demonstrate the potential of two important blocks and to test a new set of urban design guidelines for mixed-use buildings with office space, ground floor retail, multi-level parking and roof-top duplex houses. Galleria entrance in model shown above. Redevelopment plan for largest low-rise public housing project in the U.S. Plan relocated buildings, integrated new commercial center, schools, and recreation. Used as model for HOPE 6 Public Housing Renovation Program. Master Plan for 400 condominium units, hotel, ski lodge, retail space and outdoor recreational amenities. 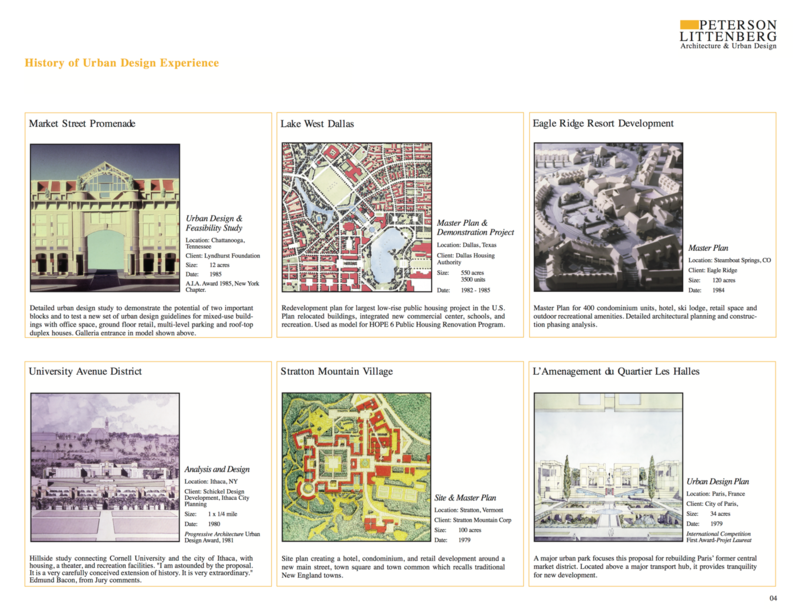 Detailed architectural planning and construction phasing analysis. Hillside study connecting Cornell University and the city of Ithaca, with housing, a theater, and recreation facilities. "I am astounded by the proposal. It is a very carefully conceived extension of history. It is very extraordinary." Edmund Bacon, from Jury comments. Site plan creating a hotel, condominium, and retail development around a new main street, town square and town common which recalls traditional New England towns. A major urban park focuses this proposal for rebuilding Paris’ former central market district. Located above a major transport hub, it provides tranquility for new development.